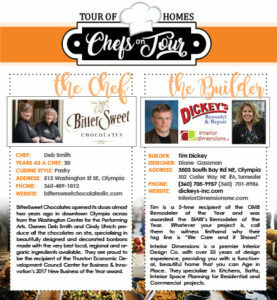 Tickets for the 2018 Chefs on Tour event SOLD OUT early, so make sure to get your as soon as they go on sale for 2019. Check back for ticket sale information. 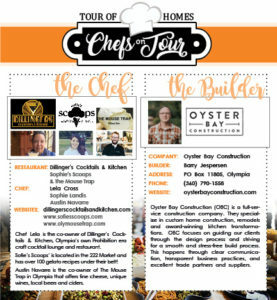 Click here to download the full 2018 Chefs & Builder Biographies! Chefs on Tour is an exclusive new way to experience the Tour of Homes. 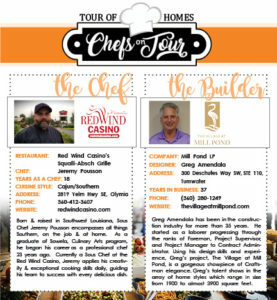 A ticket to this event lends guests the opportunity to mix and mingle with the builders and chefs themselves, in a fun-filled atmosphere. Each builder and chef team have the chance to be creative in their own way by providing a unique experience to their guests. For instance, one year, Dillingers Cocktails & Kitchen, along with The Artisans Group, delivered a “Mad-Men” themed evening, complete with live music from the era, an oyster bar, old fashioned drinks, and a delightful spread of food, including Ambrosia Gelato! For more information contact brianna@omb.org or call 360.754.0912. If you would like to sponsor this event contact jenni@omb.org.